The new handle on the PowerLift® Rare Earth lift magnet features a positive lock-on and lock-off mechanism that requires the operator to manually switch between the two states. This prevents the handle from being turned only ”partially on” and giving the operator a false sense of security that the magnet is holding safely, or from being accidentally bumped to the “off” position, dropping the load pre- maturely. The handle’s locking mechanism is engaged by first pulling out on the handle to release the lock pin, than rotating the handle to the “on” position. Turning the magnet off requires the same steps in the reverse direction. PowerLift Rare Earth Lift Magnets are compact, light-weight permanent magnets that have on/off functionality, but require no electricity - reducing operating costs and eliminating the fear of dropping the load being lifted during a power failure. They can be used on flat or round non-flexing surfaces and contain an internal release device that does not contact or damage the surface of the part being lifted. 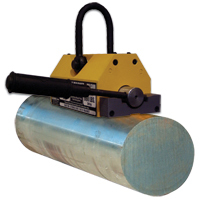 Ideal for lifting thick steel plates, pipes, round stock, castings and more, PowerLift Magnets have holding values from 220 pounds to 6600 pounds for flat items and 110 to 3300 pounds for round surfaces. For safety, lift values are clearly stated (in pounds and kilograms) on each magnet. Conforms to ASME B30.20 Standards.